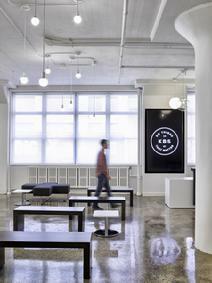 Open, bright and welcoming where the users goal for this creative company’s reception, lobby, and places to gather. Although each space spilled into the other with no demarcation or edge between, the lighting challenge was to create identity for each space, and an opportunity to be playful and create contrast in a white box. Thru the use of simple lighting equipment, a series of rooms are created with no or little walls and boundaries. This unique lighting scheme was created with generic lighting equipment using LED A-lamps, CFLs, and tubular fluorescent lamps. A series of large opal and clear globe pendants dance around the main entry and receptionist desk to create diffuse glow and sparkle. Smaller suspended pendants, with CFL G-lamps, define places to sit and meet. Their arrangement and conduit on the ceiling was an opportunity to be artistic. The G-lamp pendants define an edge to the open office area, illuminated with linear indirect pendants with T5HO lamps. The open lounge and meeting area is illuminated from an indirect T5HO cove along the two sidewalls. The main conference room is beyond. The sidewall coves continue into the main conference room, and a backlit box is suspended above the table. The end wall is grazed with light.